We enjoyed our 6 days on Sao Miguel Island in the Azores. But we did want to see more of the Azores Islands. It was a short hop from Sao Miguel to Faial Island in the Azores. 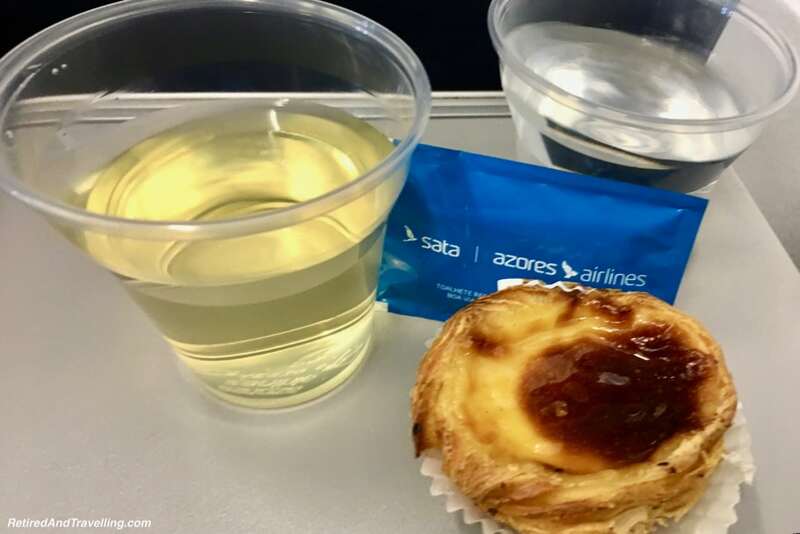 Sata Azores Airlines runs regular flights from mainland Portugal to the Azores Islands and between the islands. 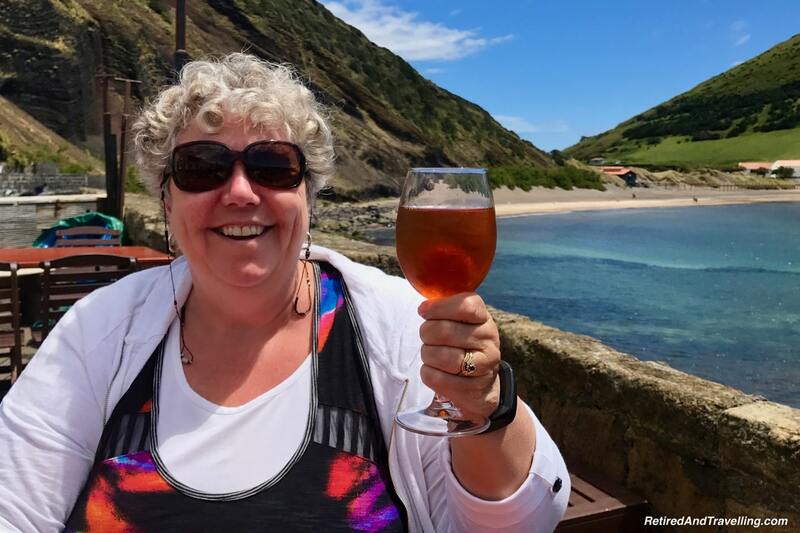 Wine and custard tarts ensured that we landed on Faial with a smile on our faces. 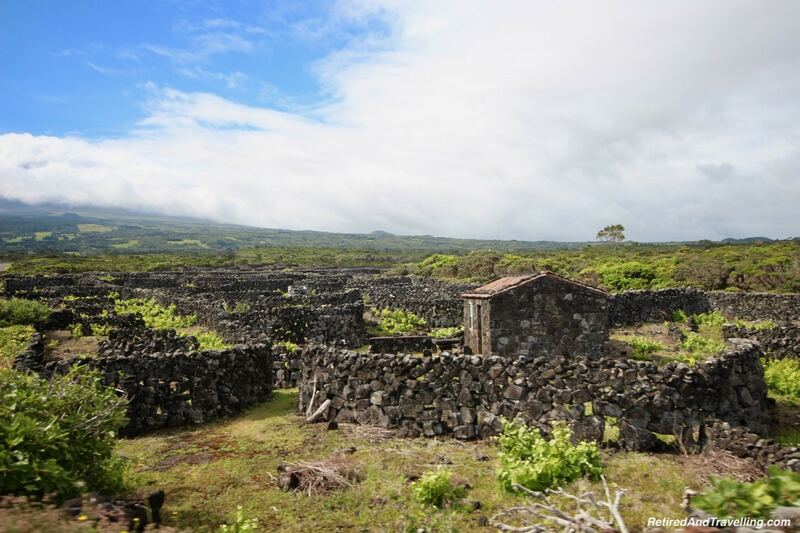 We enjoyed a four day stay on Faial Island and explored Pico Island from there. 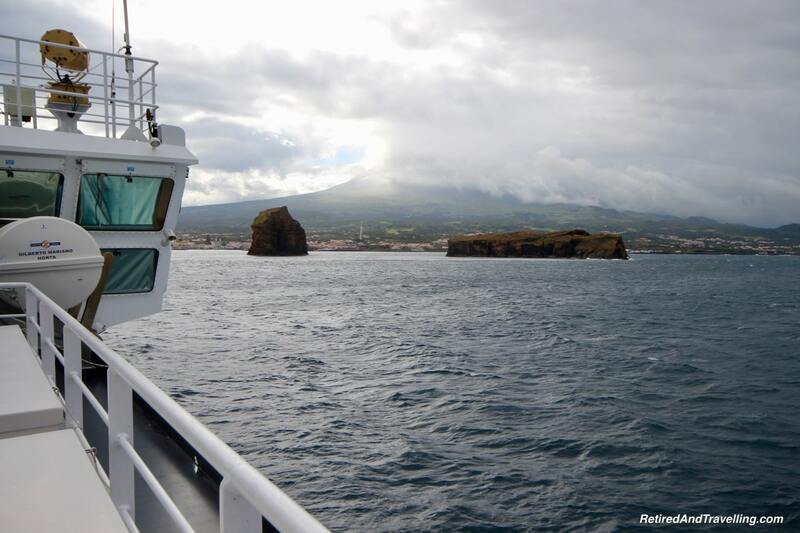 Despite the fact that it would take all day, I really wanted to take the ferry to Faial. But the larger ferry from Sao Miguel out to the central group of islands did not run when we were in Portugal in May. Ferries between the islands in the central group let us try more than one island once we were in Faial. Check the schedules if you want to travel by ferry. A quick cab ride got us from the airport into the main port city of Horta. For the first time on this trip, we were not able to check in early. This would be the first of many disappointments we would have with our hotel in Horta. It was in a great location and had all the basic services. But non-existent customer service and poor food quality would ensure we did not return if we came back to stay on Faial Island. 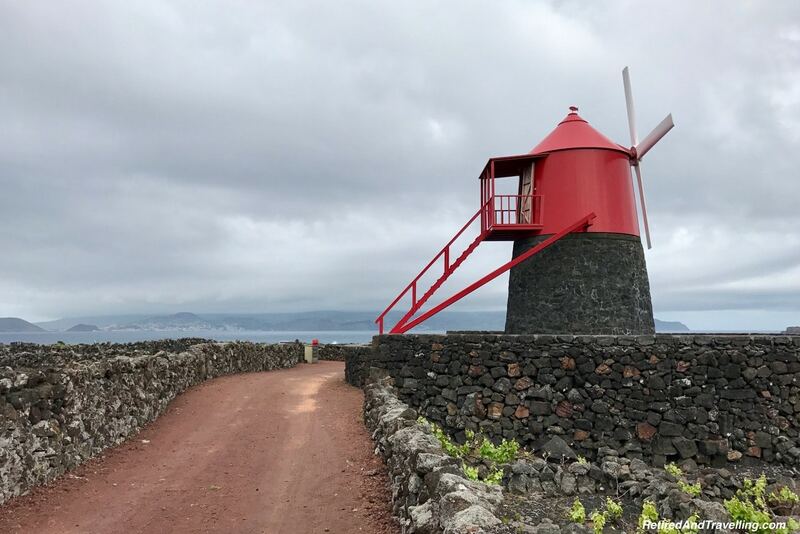 A four day stay on Faial Island gave us a chance to get a feel for the island. We certainly found a lot to see and do during our very busy visit. 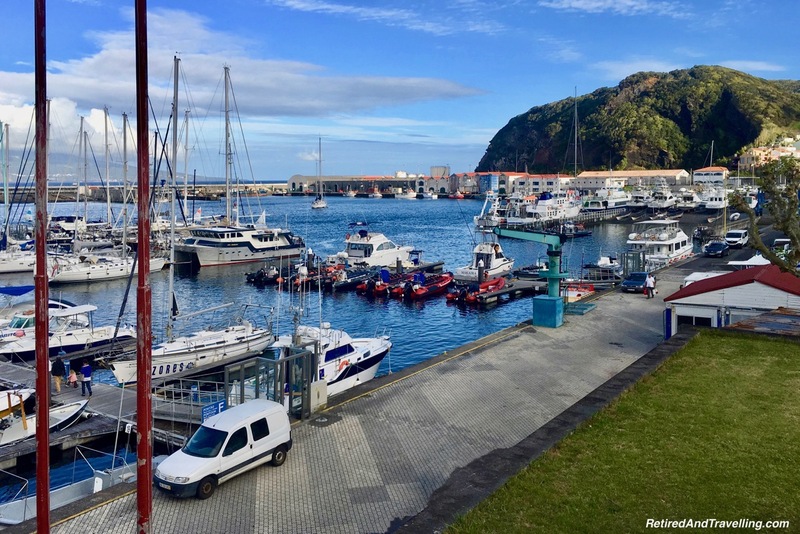 For our stay on Faial Island we chose Horta. It is the main port town. We walked the waterfront for a great view of the boats in the harbour. 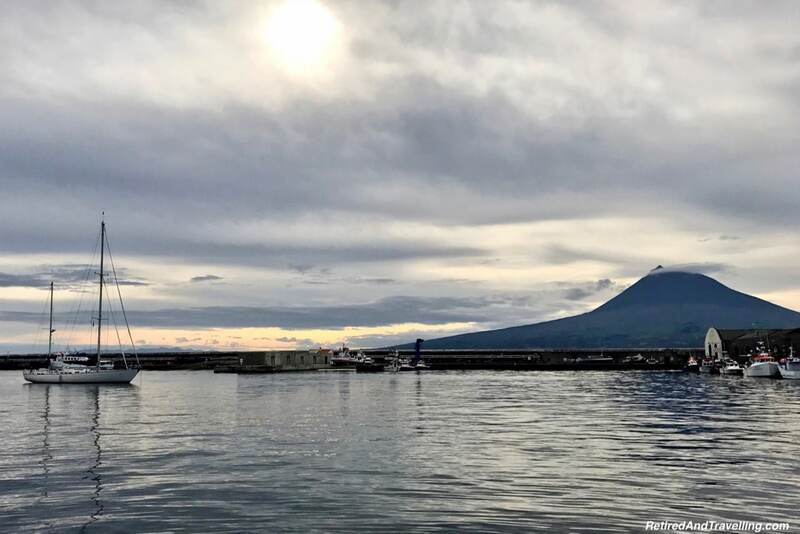 Every day we looked to see if we would get a clear view of Pico Mountain across the water. 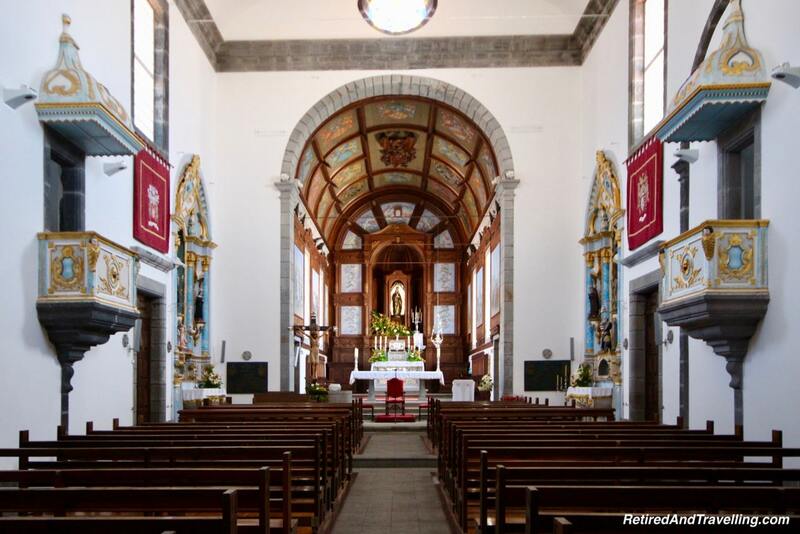 There were many churches in Faial. When we left the island by ferry, we could see the steeples standing high in the air. The Nossa Senhora das Angústias Church was close to our hotel. We wandered in one day to see this larger church. 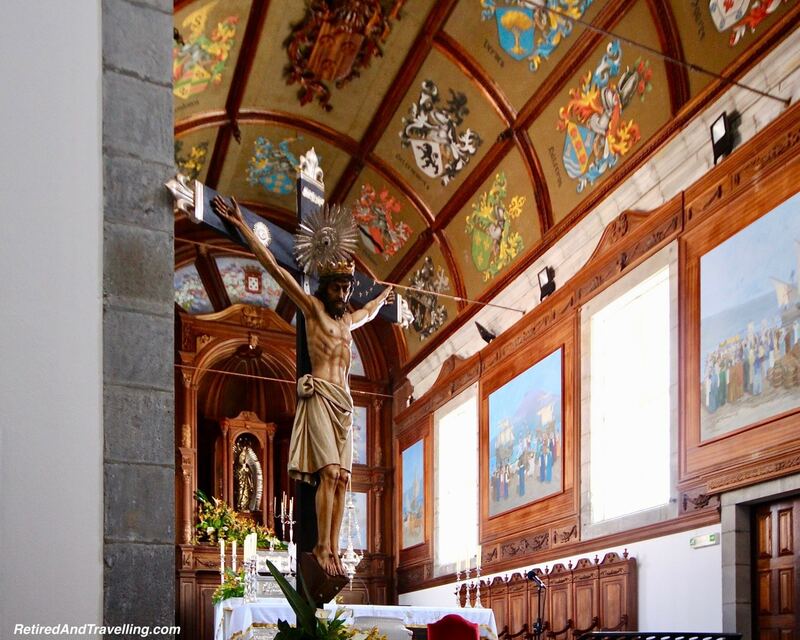 It was a distinct contrast to the very tiny churches of the Holy Spirit we saw everywhere when we toured on Faial and Pico islands. We wandered to Porto Pim and found a sheltered sand beach. The locals enjoyed the water it even though the water temperature in May was only about 16℃ (about 60℉). There were lots of cafes in the port with tables outside on the patio. We made sure to try the local beer and wine. 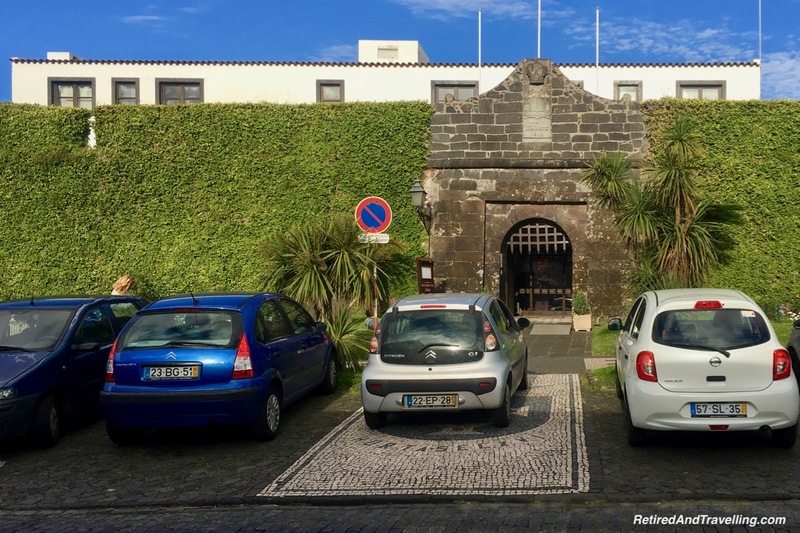 When we planned our trip, we had considered staying in the Pousada in the old fort for our stay on Faial Island. We had a great experience in the Pousada in the Algarve. But our reservations were booked before we knew how nice a Pousada experience could be. We found the food in Portugal to be great. It was not hard to get a great meal for a reasonable price. 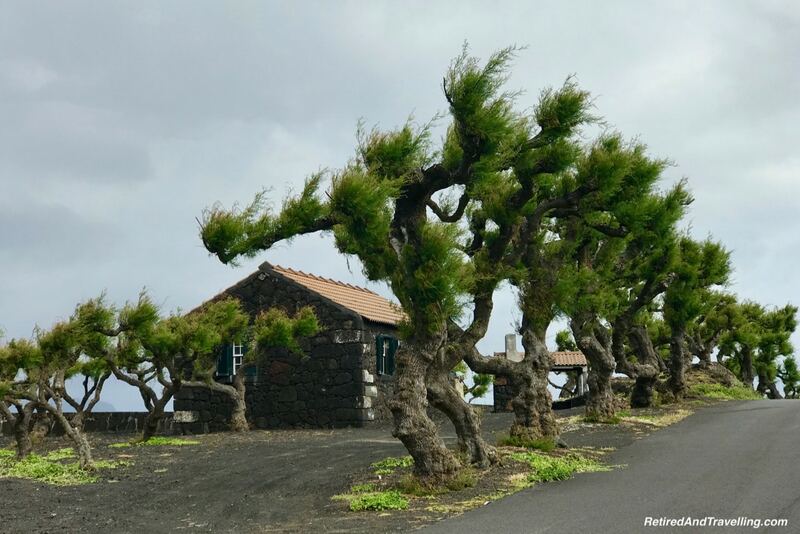 On our stay on Faial Island, it was no different. 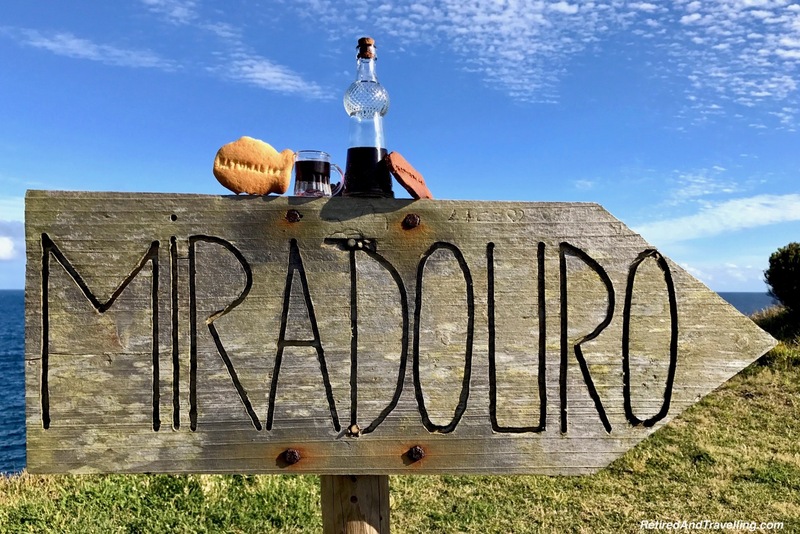 Each of the Azores Islands has slightly different specialties. Seafood is generally good on all of the islands. 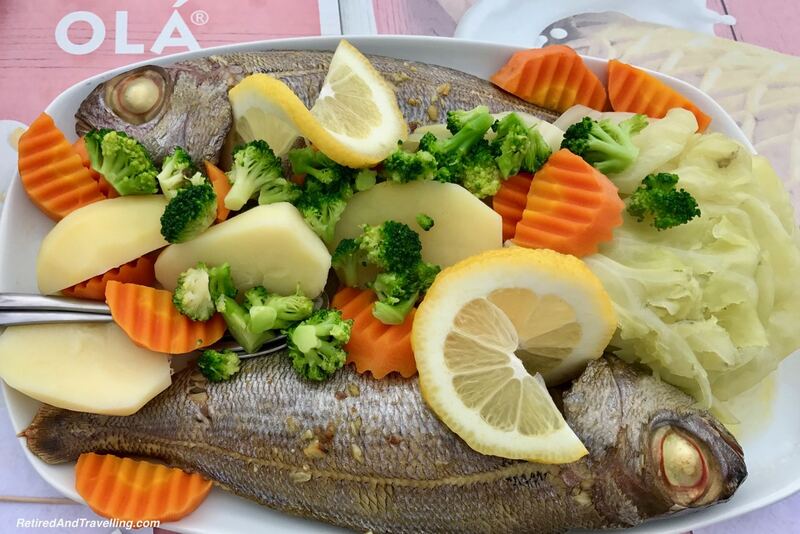 We had the most amazing fresh grilled sea bream fish at a local port bar on Pico. The big tourist attraction on the main street was Peter Cafe Sport. 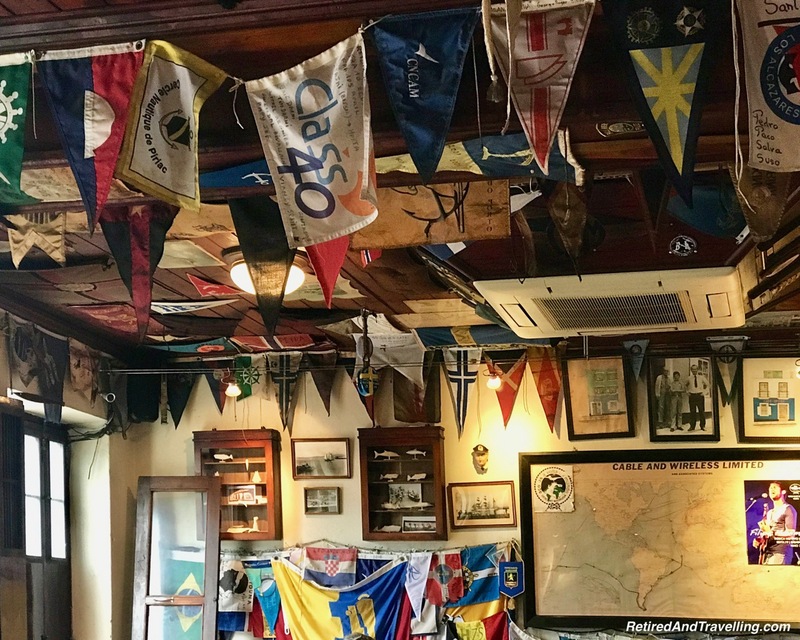 It is a legendary place for ship crews to come and hang their pennants. The walls and ceilings were covered with the flags from different countries and different crews. We even found one lonely tattered Canadian flag. The cafe served snack food and meals. 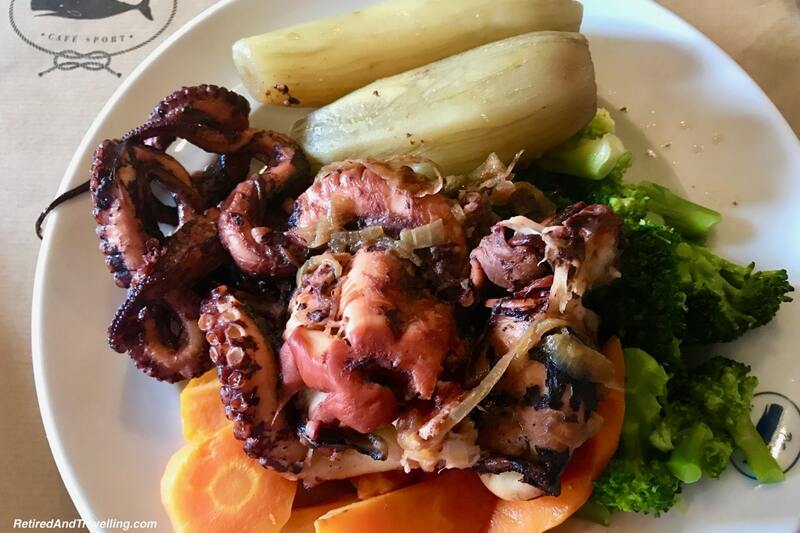 We ate a whole octopus at Peter Sport Cafe one day for lunch. Octopus had quickly become our favourite seafood in Portugal! 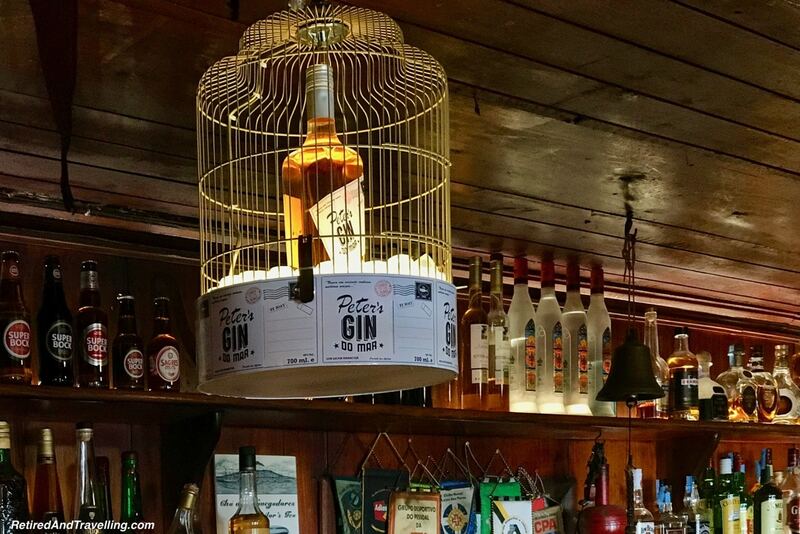 But the bar may be more famous for the homemade gin. There are several different concoctions to try. 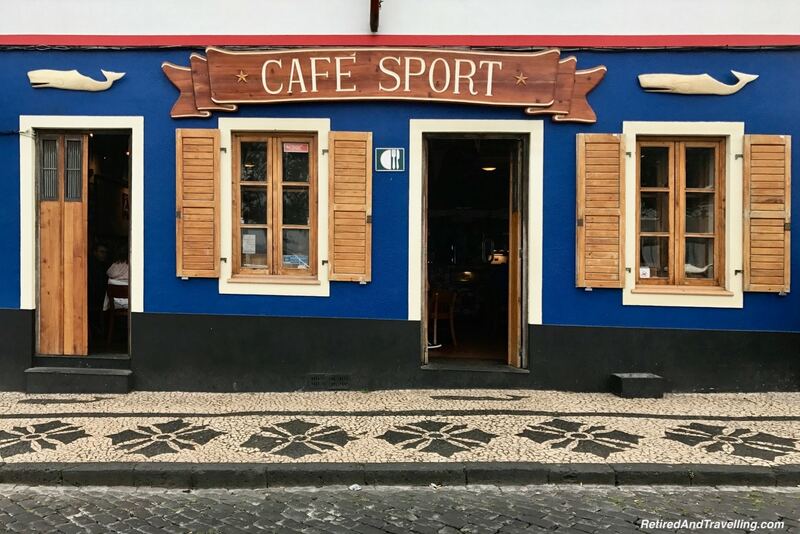 We found another Peter Cafe Sport when we visited Porto and had another chance to sample the gin. We had lots of local wine from Pico Island. There are also many liqueurs made locally. Most of them I found much too strong or too sweet. But when I was happiest when I was given homemade blackberry liqueur. Our Faial Island tour guide Pedro celebrated the end of each day with a blackberry liqueur toast. So good! When we toured Lisbon, we became custard tart addicts. 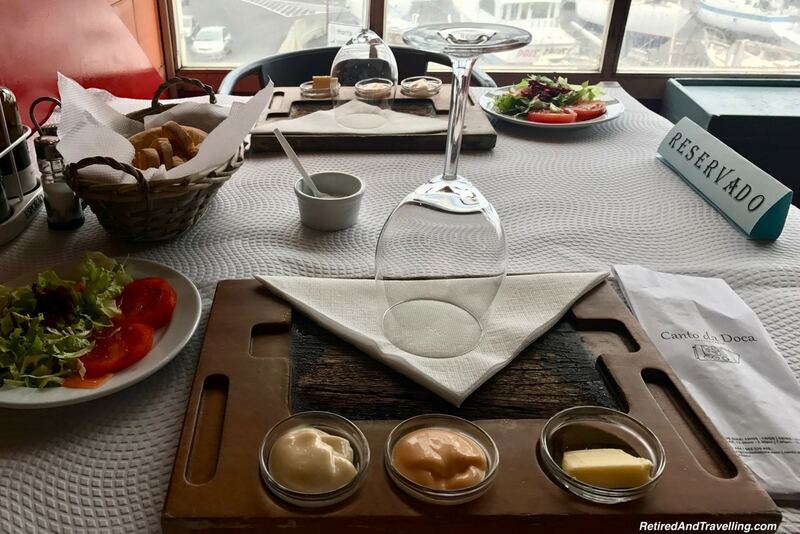 In the Azores we looked for more local specialties. Our favourite had to be the drunken pear. 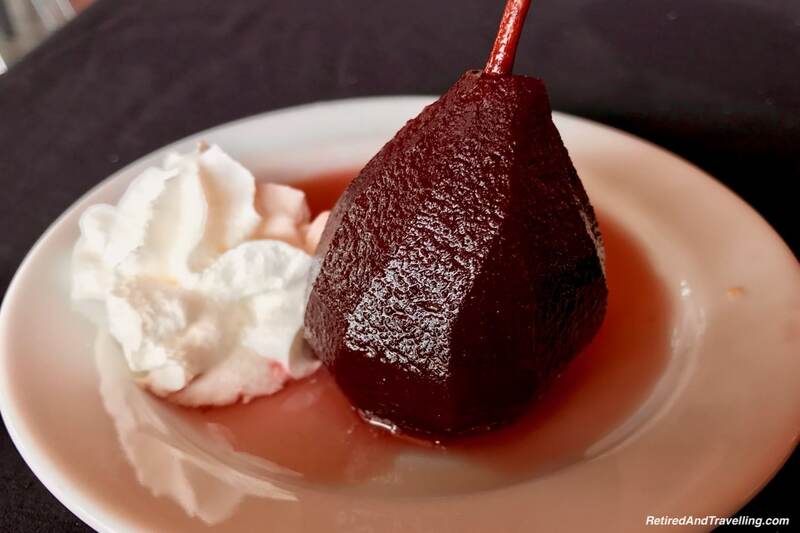 The pear was peeled and then soaked in sweet red wine. Yummy! 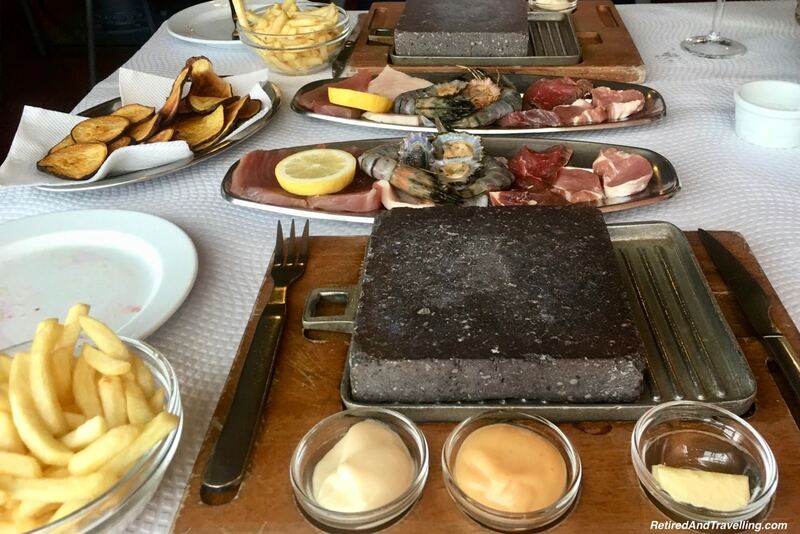 The most unusual food experience we had on our stay on Faial Island was a dinner we grilled ourselves on a very hot lava stone. At Canto Do Doca we ordered a plate of seafood and/or meat. A very hot slab of lave stone was set at our table. Then we cooked our meal to our perfect taste. The staff were welcoming and engaging. It was a great evening out! 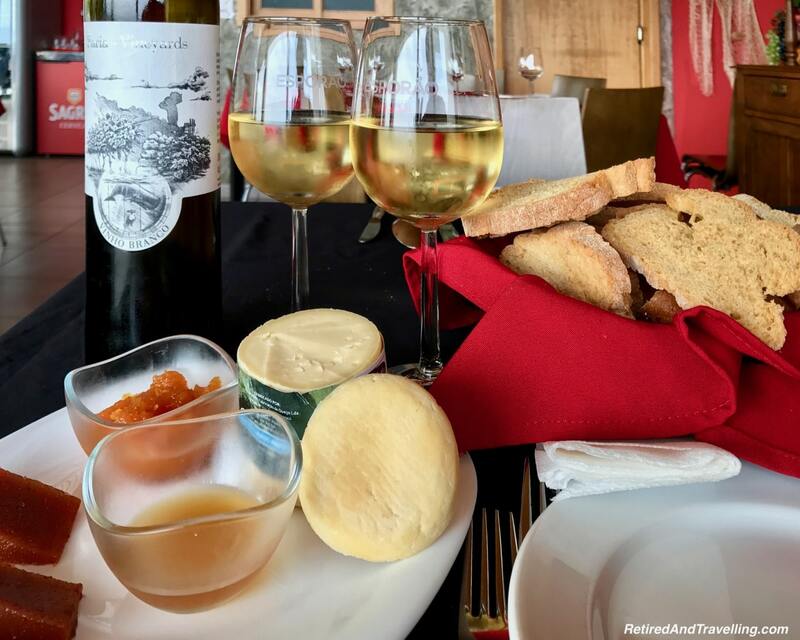 When we travel, we will often do food and wine tours. You can do both in the Azores. 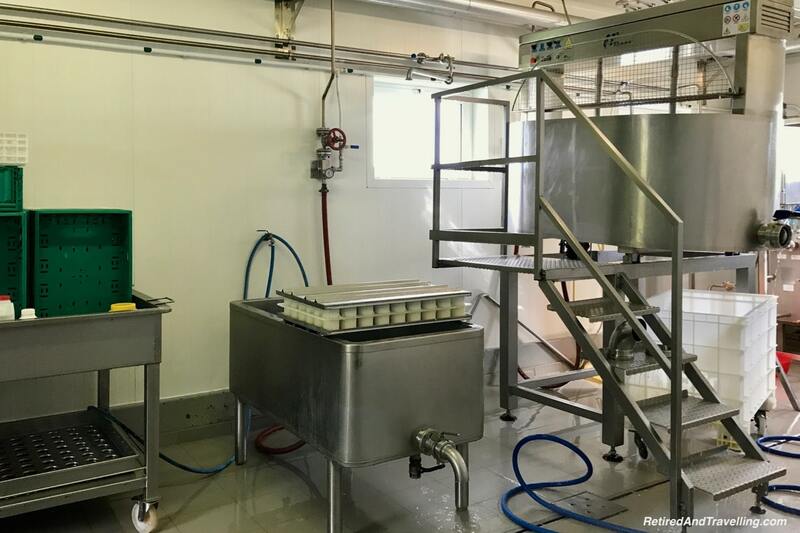 When we did our day trip of Faial Island with Naturalist Science and Tourism our tour guide Pedro would not let us miss the chance to stop at the Morro Cheese Factory. The islands are known for their dairy production. They have many award winning cheeses. Don’t pass this by on a stay on Faial Island. We saw them making the tasty cheese we sampled at lunch. It reminded us very much of touring the Parmesan factory when we visited Bologna. 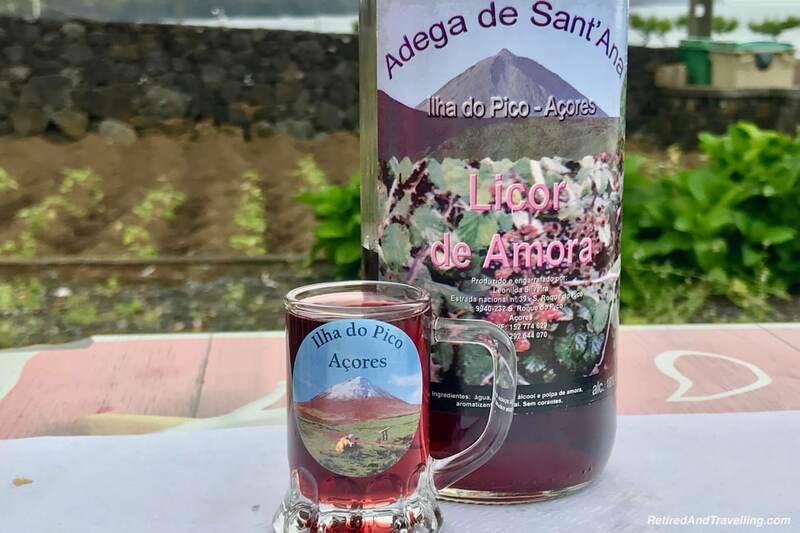 Wine in the Azores is produced on Pico Island. 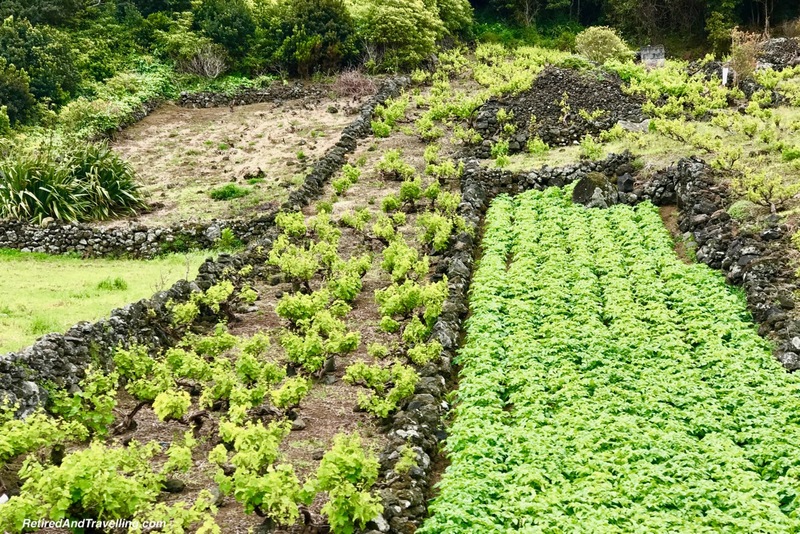 We got a great chance to look at the wine fields around the island when we toured Pico Island for the day with Naturalist Science and Tourism. We did not stop at a wine factory but there are opportunities available to tour wineries in Pico. 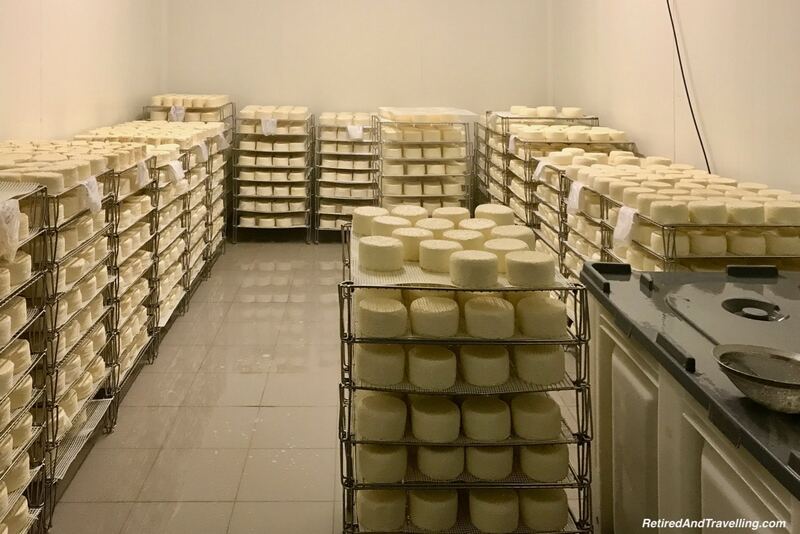 When we toured Sao Miguel Island, we got a chance to see another food factory. 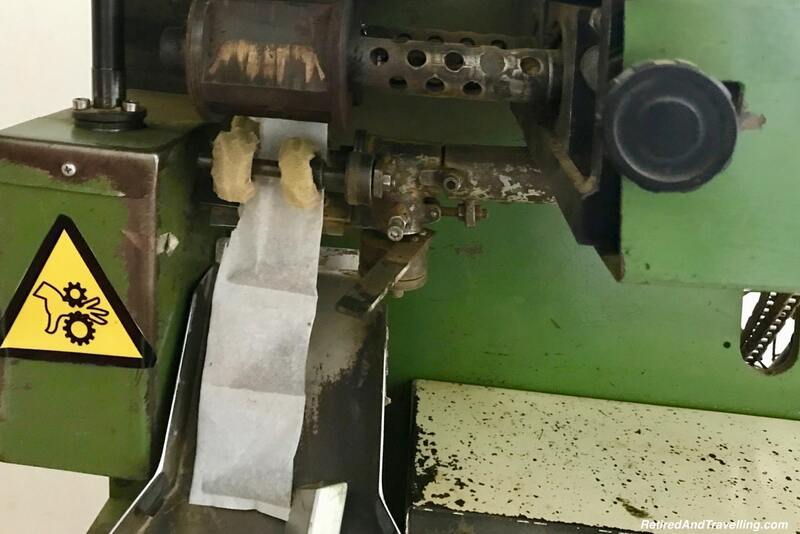 We were surprised to learn that tea is grown and packaged on the islands. 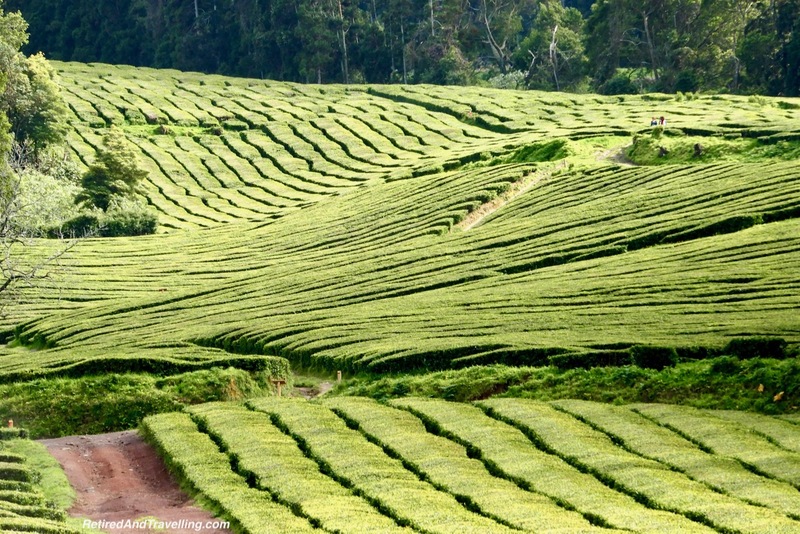 We heard that there were coffee fields and production on Sao Jorge Island. But they produce such a limited amount that little leaves the island. 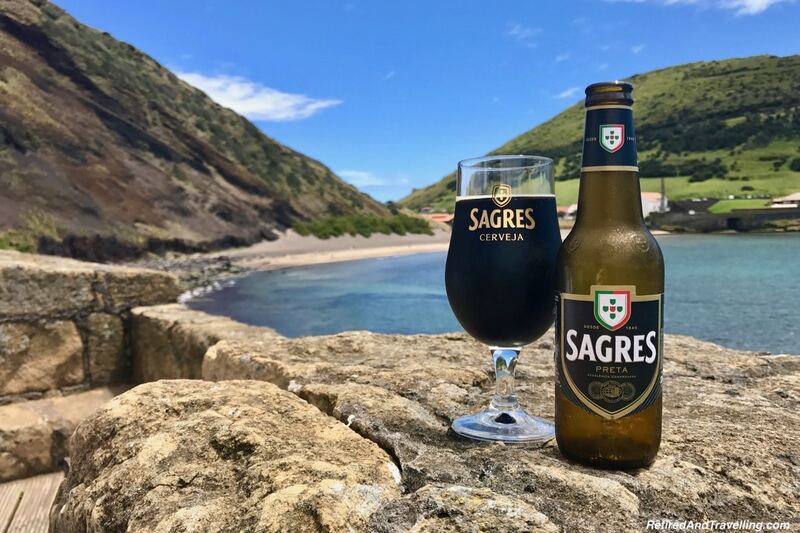 You will need to visit Sao Jorge to try that treat. This is an easy hop from Faial. 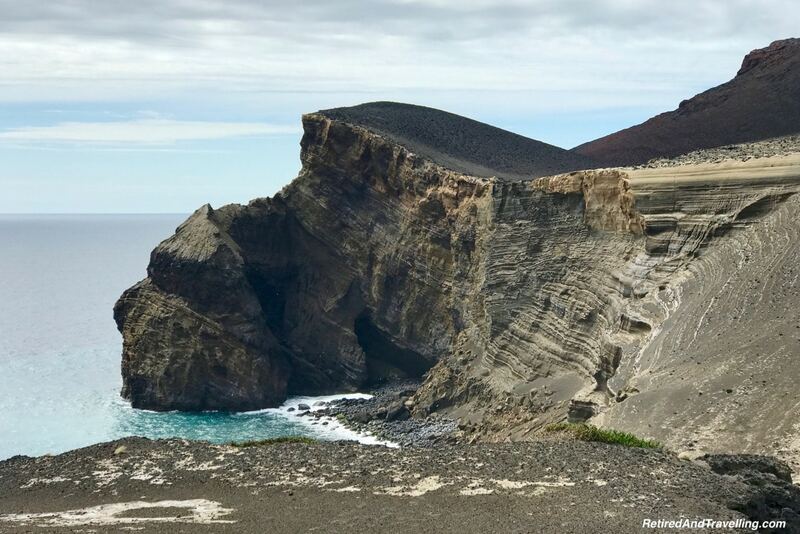 Faial is a smaller island in the Azores but we found so much to see when we toured Faial Island with Pedro from Naturalist Science and Tourism. As we travelled up and down the hills, there were many spots to get great viewpoints of the island of Faial. 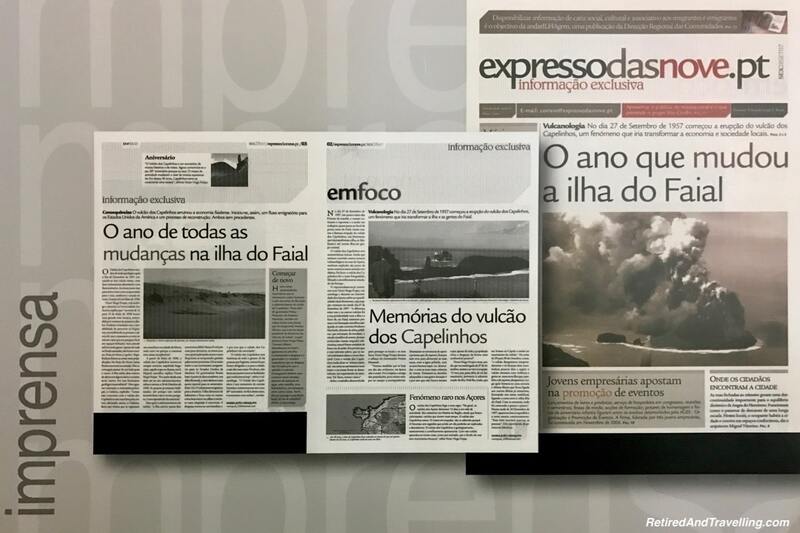 We got a great view of the volcanic history of the island when we visited both the Faial and the Capelinhos calderas. The museum at Capelinhos was great. 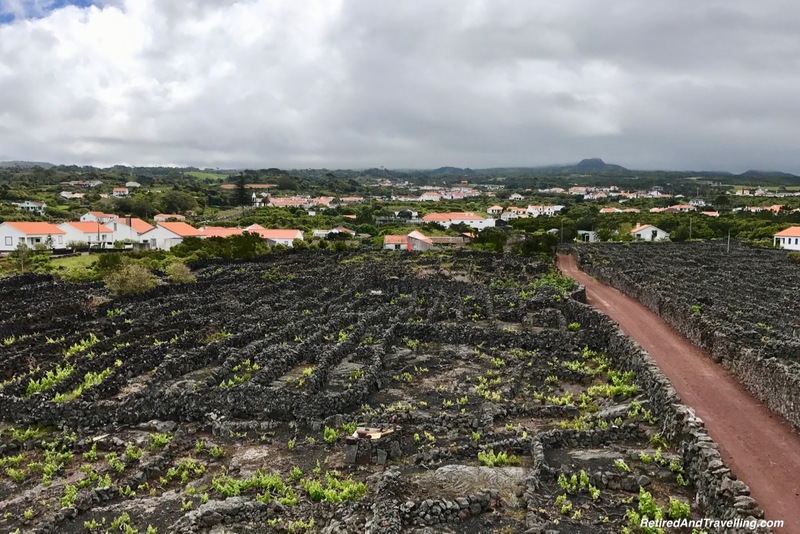 We learned so much about the volcanic history of the entire chain of the Azores Islands. 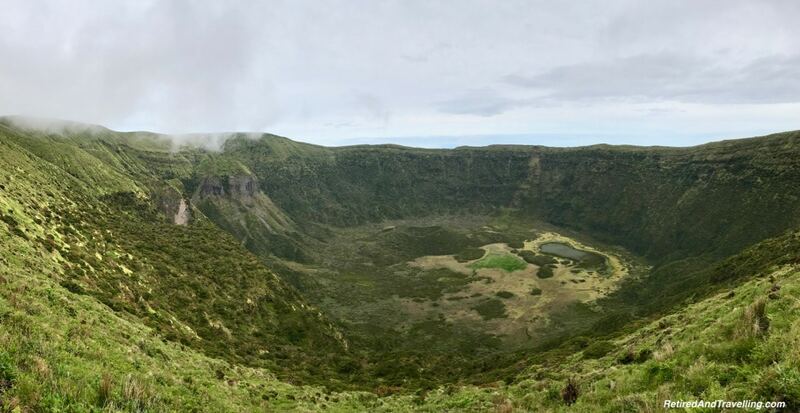 We wished we had visited the museum before we visited the calderas on Sao Miguel Island and the great caldera at Sete Cidades. It was great to stop around the island coast. We saw many of the local swimming spots. 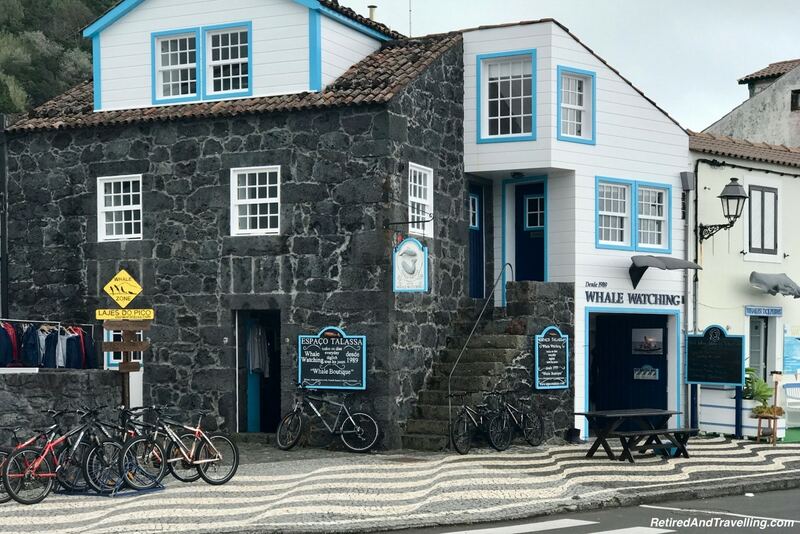 Make sure to tour around when you stay on Faial Island. 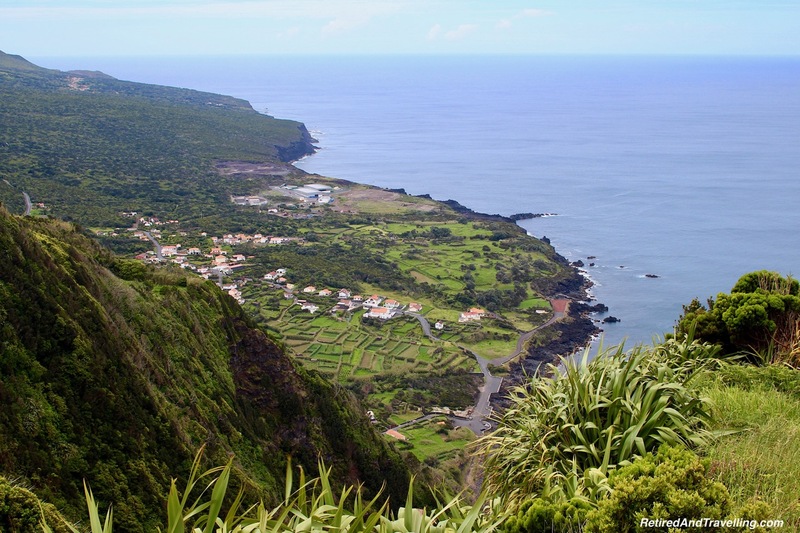 Each island will add another interesting perspective to your view of the Azores Islands. 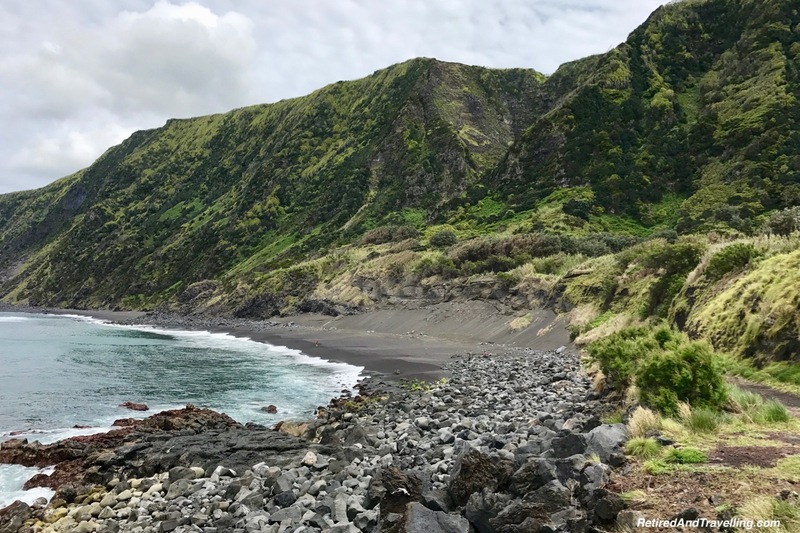 During our stay on Faial Island, we took a trip to Pico Island with Naturalist Science and Tourism. 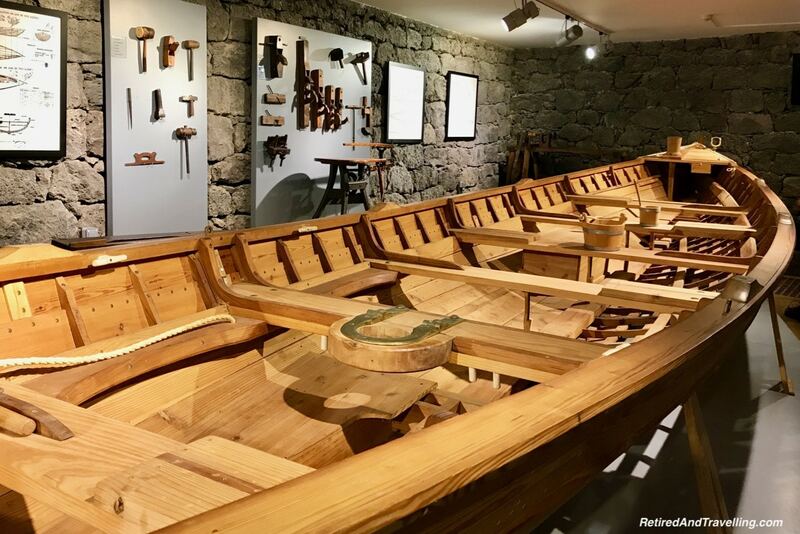 This gave us a chance to see all facets of the history of this island. 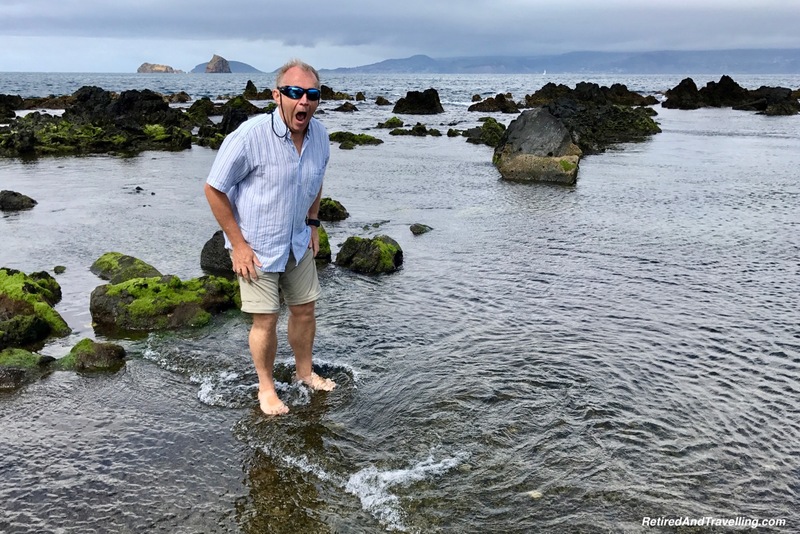 The high point of Pico Mountain was covered when we visited the island but we did get glimpses of it across the bay from Faial. This volcano has not yet erupted. 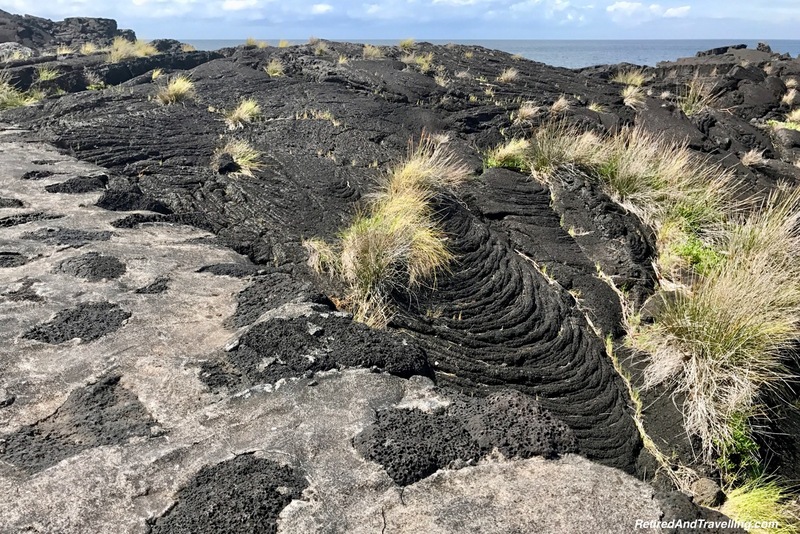 But around the island we could see great examples of volcanic rock and frozen lava flows from other eruptions that formed the island. We found shallow natural swimming pools along the shore but they were much too cold for us! 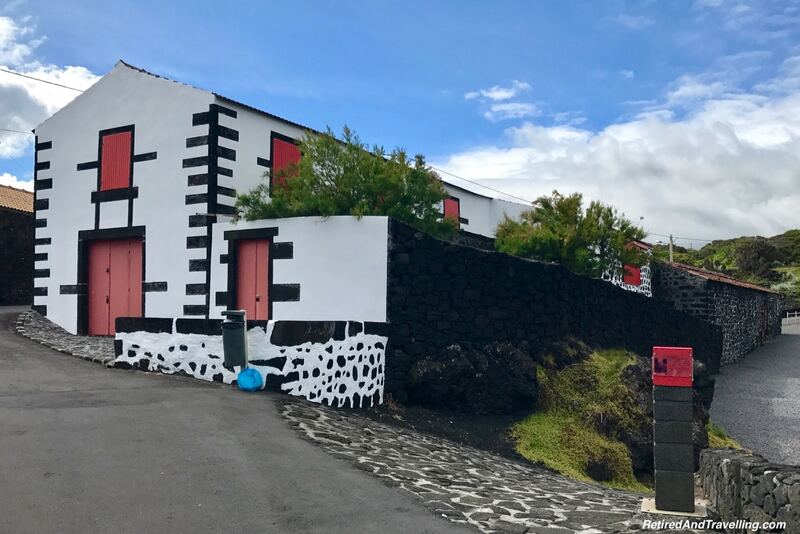 As we drove around Pico Island, we saw many great examples of interesting restored buildings. The island was green and verdant when we visited. Fences made of large stone separated gardens and created very distinctive looking wine fields. There we signs everywhere of the growing wine industry on Pico Island. 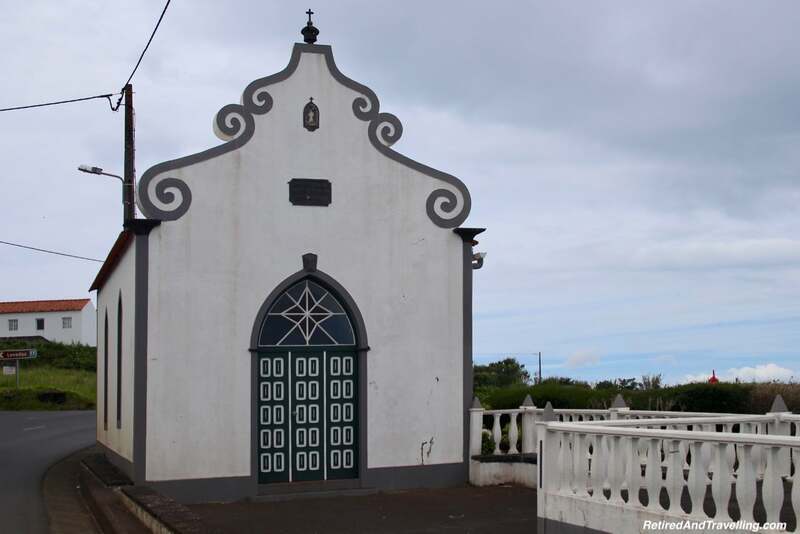 We visited Lages do Pico, the most important whaling village in the Azores. When the whale hunting business finally closed up in the early 1980’s the new business of whale watching started here. 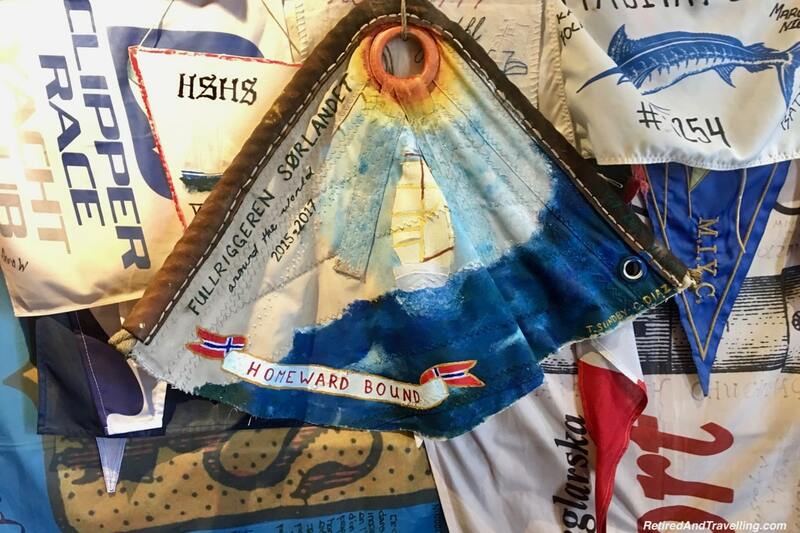 A visit to the Whaling Museum gave us a great overview of this historic period on Pico. 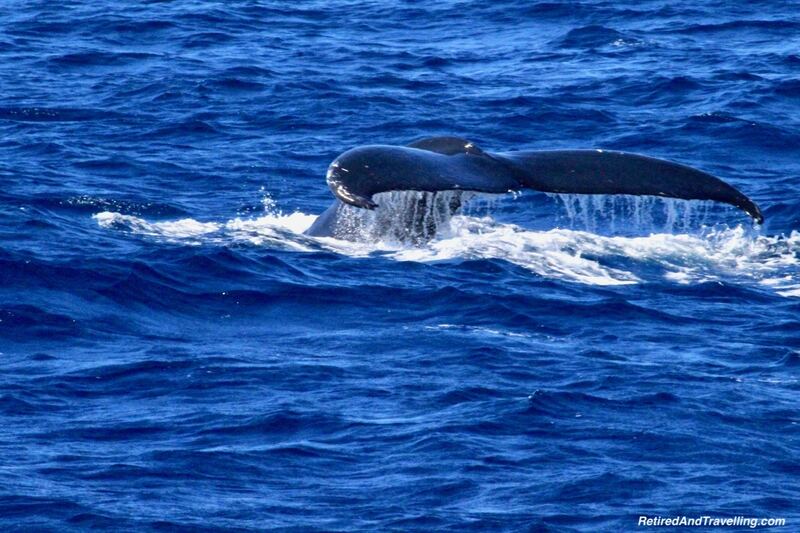 Whales can be found all around both Faial and Pico Islands. You can get a whale watching experience from either island. 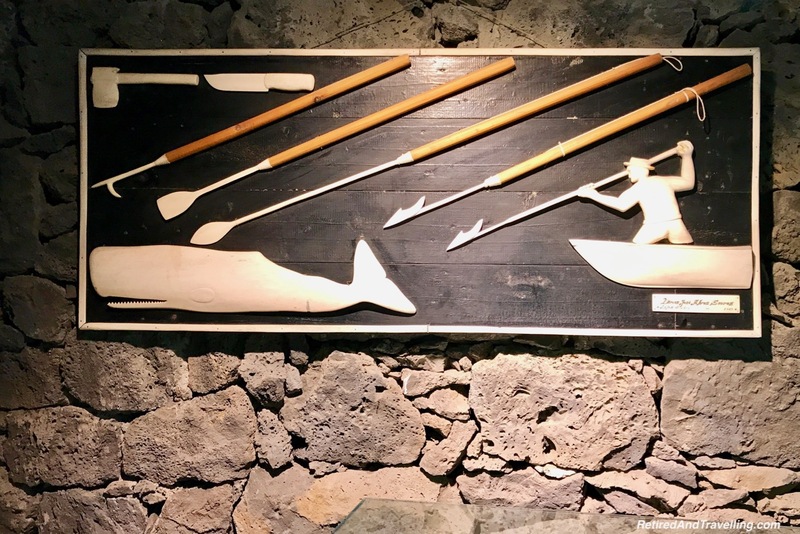 Unlike the larger whale watching companies we found on Sao Miguel island, the shops in this part of the Azores seemed to be genuinely interested in ensuring you had a great whaling experience. Spotters get you close to the whales. If the weather or whales were not cooperating, the tours did not go out. We booked a whale watching tour with Naturalist Science and Tourism for our last day on the island but we ended up not going. But we certainly wished we had done our whale watching from here. 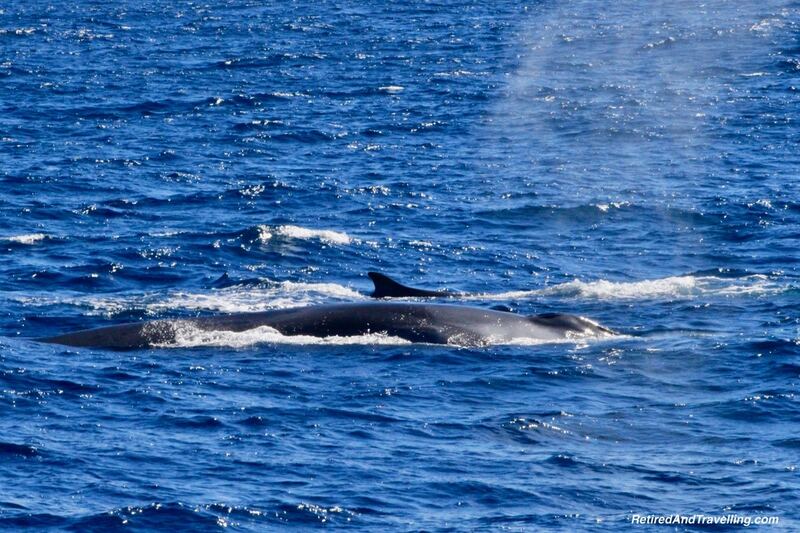 Our whale watching trip on Sao Miguel left us wanting more! We did run into people in our hotel that had a very natural whale experience. They were sitting in a cafe on the shore when a group of whales came by. That would have been so amazing! 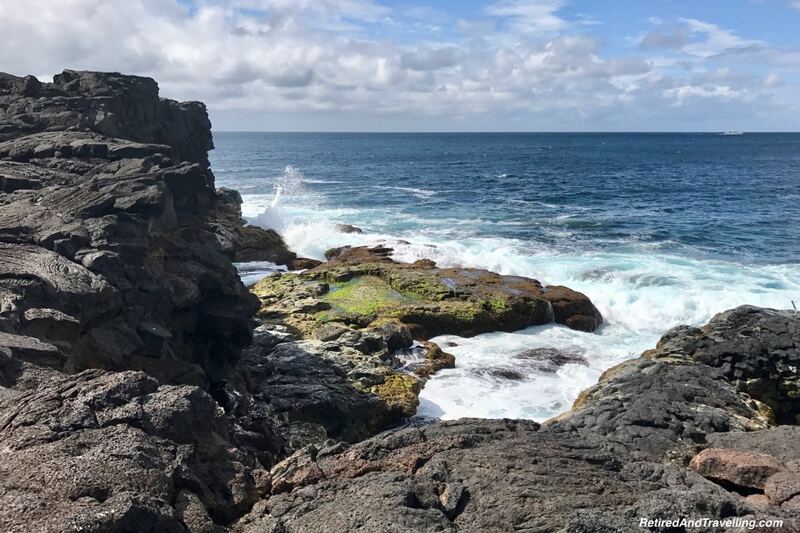 If you are looking for a great whale watching experience, stay on Faial Island and take a trip from Faial or Pico Island. 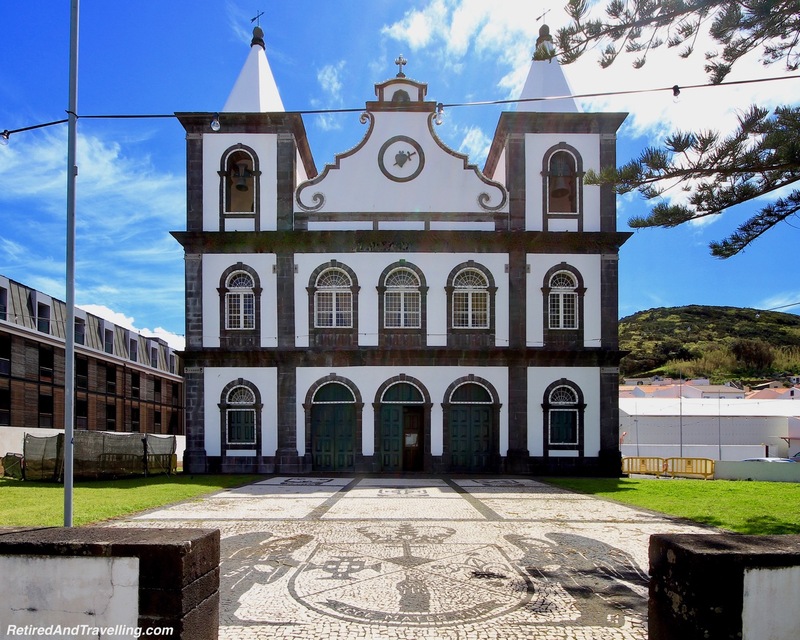 The central group of Azores Islands includes Faial, Pico, Sao Jorge, Terceira and Graciosa. 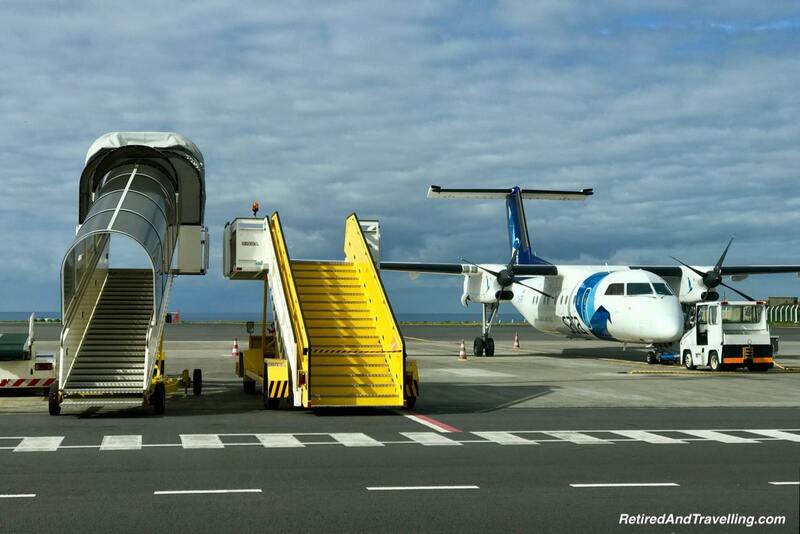 You can catch a plane or ferry to move between the islands if you stay on Faial Island or on one of the others. On our one very clear day, we could see Graciosa in the distance and far off Terceira. Not as far away as I had thought. 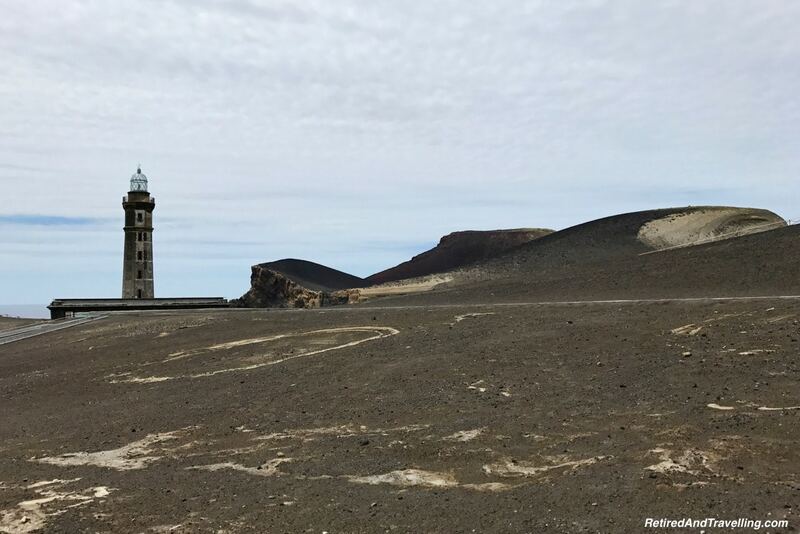 We heard that Graciosa was known for water sports. It might be a good spot to try scuba diving, kayaking or sailing along its shores. 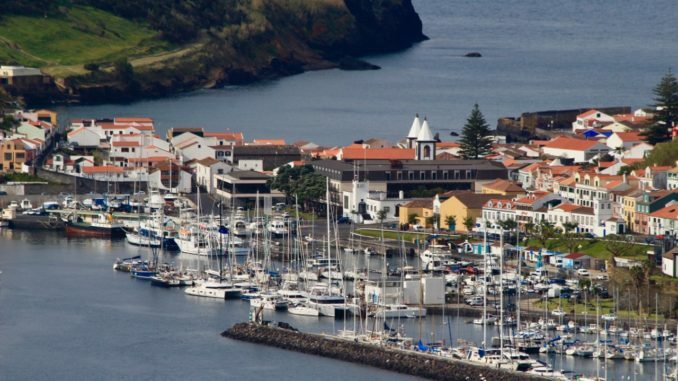 Terceira is one of the largest island. 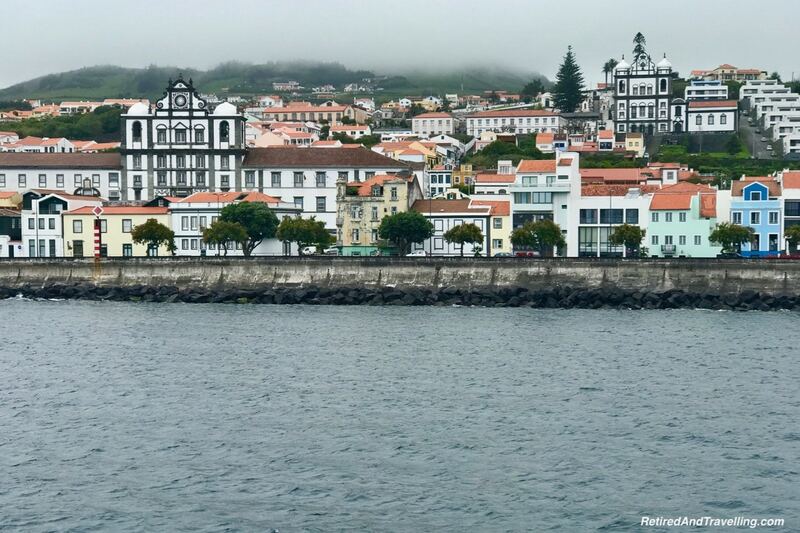 The town of Angra do Heroismo is an historic city and recognized as a UNESCO World Heritage Centre. 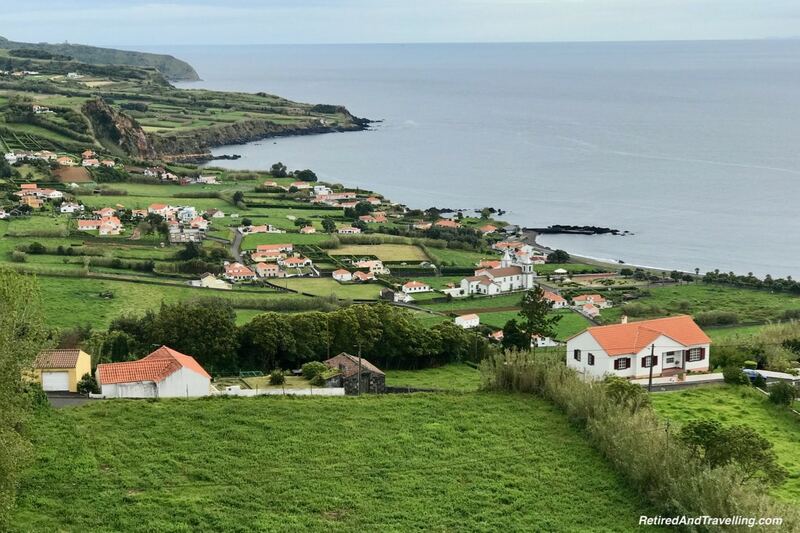 A stay on Faial Island will provide you with a great base to explore the central group of Azores Islands. 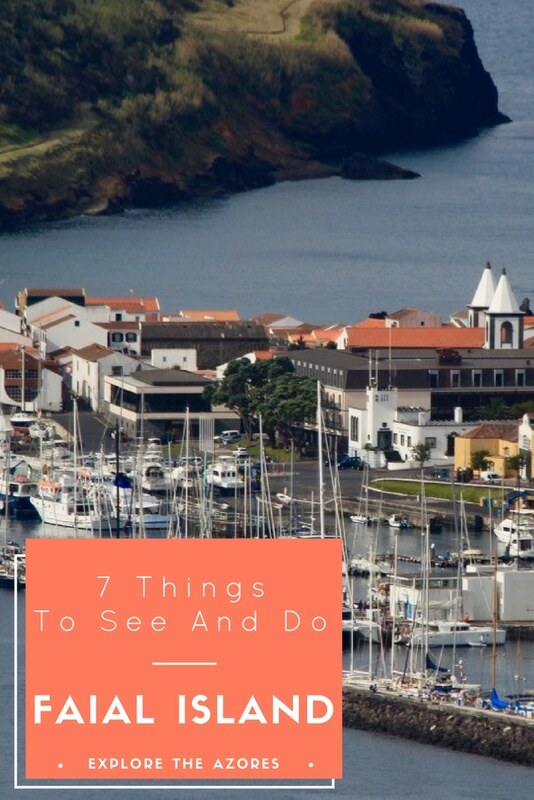 We found much to do staying in Horta and touring Faial Island. 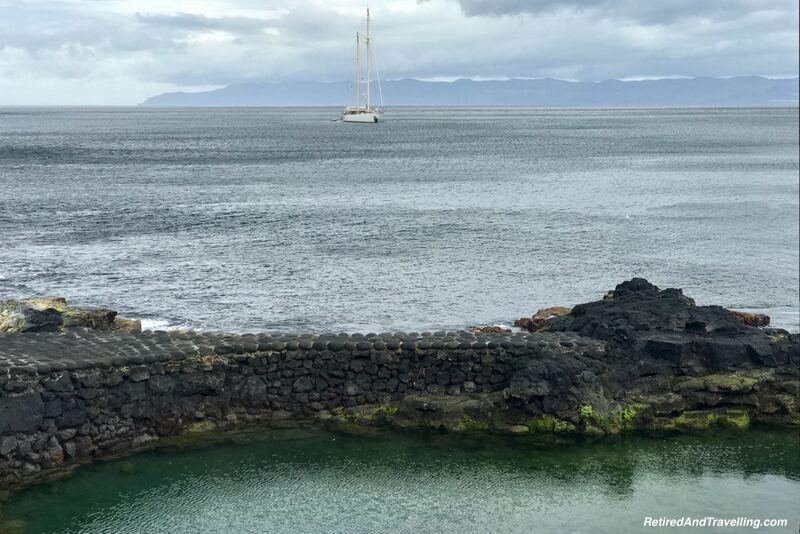 A day trip to Pico Island offered another in-depth view of the history that has shaped the Azores. You will find great food and drink and can even tour the factories producing award winning products. We boarded our flight in Horta to return to mainland Portugal. We headed next to Porto. This would add yet more exciting adventures to our 4 weeks in Portugal. 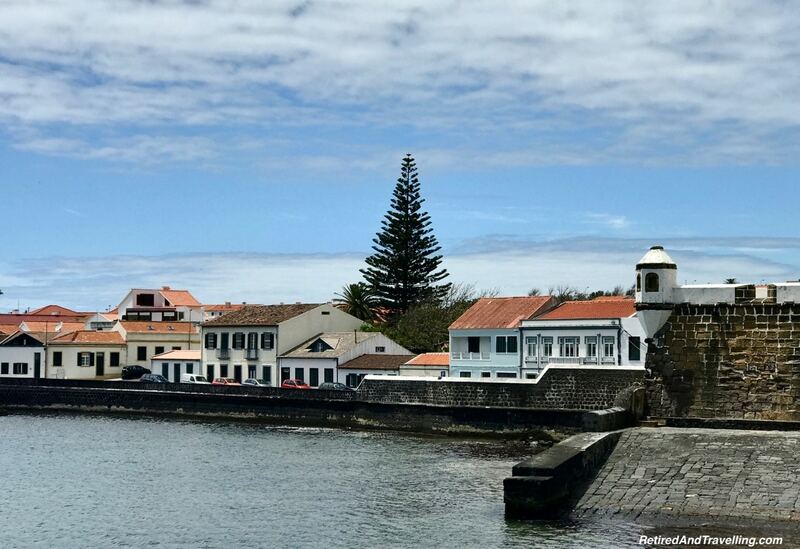 Have you used a stay on Faial Island as your base to explore the Azores Islands? 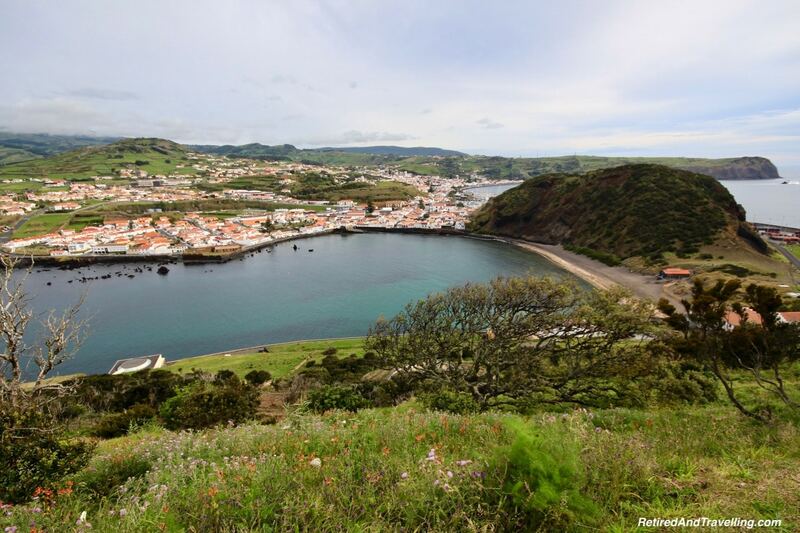 What was your favourite memories of a stay on Faial Island? I had never heard of this island till I read this article, it looks and sounds absolutely amazing!